Dave King reports that Bailey of Bristol has teamed up with Fiamma to enable a side mounted wind-out awning “Fiamma F45” to be fitted to all of its Alu-Tech touring caravan ranges. Of course with Alu-Tech Baileys representing a huge proportion of new UK caravan sales over the past 18 months, thousands of caravan owners could benefit from this new awning option. Many people have for some time used a caravan’s awning channel to slide a roll-out type of awning into it but it’s the strength and integrity of Alu-Tech that gives the frame sufficient rigidity to bolt an awning through the side wall of the caravan into the Alu-Tech frame. Fiamma has developed special brackets that are fixed to the body structure of the caravan which are man enough to take the weight of the awning, in a cover, which can be extended by just one person! I can hear the cheers from caravan sites, right now! This is a big leap forward in design and innovation as, in the past using traditional caravan construction methods a caravan’s walls were not strong enough or rigid enough to allow this type of fixing method. In its standard form, the Fiamma F45 can be extended using the dedicated winding handle; the front legs are dropped down from within the metal frame and adjusted for the terrain; this whole operation takes just two minutes. This is just a canopy which offers protection from the elements. Optional dedicated accessories are available and these include side panels to be used as rain blocker or for protection from the sun. Tie-down kits are available too. The advantages are clear; you don’t have to lug an awning around with you in your towcar or caravan; you can pop it up even if you are just on site for one night. The F45 Zip model has zips on each side of the canopy so that side panels can be zipped onto it and panels slide into the canopy’s frame on the front edge. The sides and the front can be zipped together creating a fully weatherproof privacy room with an acrylic window and curtains. With just one product you can replace a sun canopy, a full awning, a porch awning or one that fits somewhere in between. 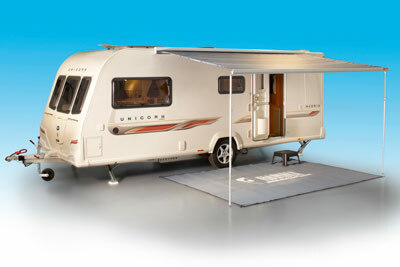 The images show the awning being demonstrated by Authorised Bailey Service Centre Reading Caravans to a Bailey Unicorn. These guys made fitting it look easy but it does require accurate measurements by experienced fitters. It is not suggested that fitment is a DIY job. 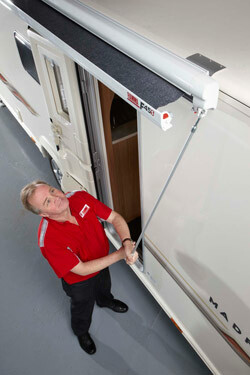 Bailey dealers have had training in the fitting of the Fiamma awnings and the price of the awning includes fitting. Price is from £691.00 for a standard F45 canopy 3m x 2.50m to £941.00 for a 4.5mx 2.50m canopy. F45 Zip with side and front panels starts at £1506.00 for 3m x 2.5m. Please note: fitment of the Fiamma F-45 awning to an Alu-Tech caravan must be carried out by an Authorised Bailey Service Centre. Failure to do so will invalidate the caravan body shell integrity guarantee (please visit www.bailey-caravans.co.uk for full warranty terms and conditions). 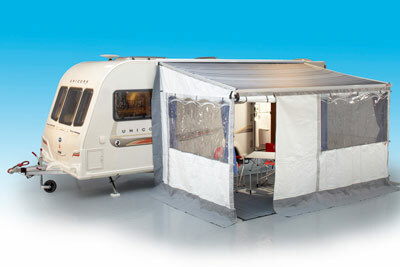 Caravanners are advised to ensure they have sufficient cover for awnings on their caravan insurance policies. As a Caravan Guard customer, please ensure your total sum insured is enough to cover the replacement or market value of your caravan, dependent on the basis of cover be it market value or new for old cover, plus a value for all caravanning equipment including any awnings. I bought a 2014 Bailey Unicorn Valencia and had the wind out Fiama fitted. Any dealer worth their salt will fit it free of charge as mine did, when buying a new caravan. It is great and I have had no problems with leaks. I have a 2014 Bailey Barcelona, looking at installing myself the f45, however hate it when companies threaten you with the usual “invalid warranty” nonsense, you have already spent 20k plus and want more. Have to agree also with the other comments, roof holes Will leak, bad design detailing, yes looks like canopies designed and installed in the 1970s. It seems easy to erect and makes a nice room to be in but the colours and designs are so boring; grey contrasted with more grey and a grubby looking white. Recently I saw a Quest version of the side panels it was called the “Italian” and it looked really attractive with window panes printed on to the design. It was quite cheap as well, about £400. But I haven’t been able to trace it on the web since that time. Anyone know anything about it? Have had a F45 fitted to a Bailey Unicorn, the wind out canopy is quick and easy to use, but haven’t worked out how to fit the two brackets we need to utilise the Zip on sides panels. considering the high cost of the fitted fiamma sunblind/ awning, can it be removed, and refitted if I change my caravan for another Bailey caravan ? The idea is certainly a very good one but this awning is totally lacking in any style.It reminds me of the awnings that we used back at the start of the1970s when I first started caravanning! Will it fit a Swift 570? Regarding slope (RG Smith) it depends what length you make the awning legs, will also allow for uneven pitch’s, adjusted and secured by TWO butterfly catch’s.Fiamma kit is very good. Just ask any motorhome owner, ther standard kit on most van’s. Depends where mounted on van (and the length of the awning you buy) to not cover window! splash the cash you caravanners. Looks good, and easy to put up. Bound to be popular. One concern though – is there enough slope on the roof to ensure heavy rain does not form pools and bring the whole thing down? Looks good but what will i do with my porch and full awnings. Looks very good. Just what has been needed for caravanners, especially the older caravanner like me. However the price seems seems a little high. I have a Fiamma fitted to the top of my Fleetwood Heritage fitted with a 12 volt motor and remote controlled, which makes it very simple and safe to operate. I have used it for 3 years now, and find it quick and easy to use. The only things you have to store are the three sides, the stretcher bar for the roof and two frame bars for the side panels, which takes up a lot less room than a conventional awning. 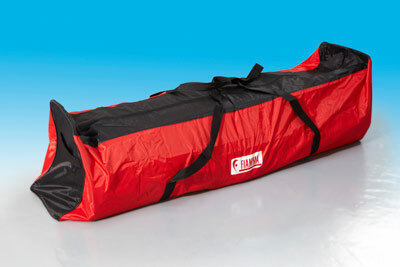 The other bonus is in wet weather you can packup under the awning and then just roll in the roof in to its housing. I dont like the fact that the awning obstructs a window. Seems like a lot of cash for something that doesn’t look very professional. I don’t think I will be changing my Bailey Indiana for a new Bailey any way as I don’t like the new layouts.